It's a walk trough the historical and geographic most interesting places of the territory of Cavallino, to discover the typical agrestial and bathing landscapes. Suggested period: from April to November. Intinerary: Cavallino "porte" - bank canal Pordelio - Cavallino via Fausta - via del fante - beach faro basin - Cavallino "porte"
Length: km 7,6 approximately - Duration: 2,30 hours approximately. Viability: The excursion takes place first on the river dike, and then on asphalted and on dike streets (1.3 km approximately). Warnings: We suggest to be careful with traffic along via Fausta! Cavallino "porte" , historical lagoon access way, connected with Pordelio canal and with the Litoranea Veneta. 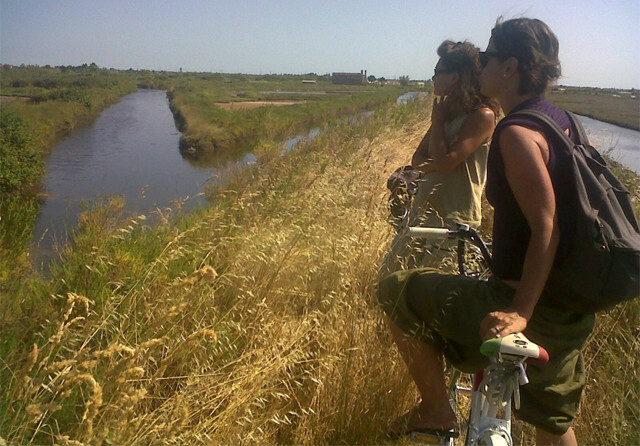 The lagoon landscapes of Cavallino valley and the D'arco canal with typical buildings, basins and tamarisks. The neighbouring dunes uncultivable areas, the pinewood and the beach the fluvial mouth. The lighthouse and the tourist marina. The fishing-boats: square fishing-nets, the environment of Sile Piave Vecchia, cane fields and typical avifauna. From Ca' Savio turn right into the road of the same name, then left into via Pealto and then right again into via Montello. Along the route many small pathways lead off to the left through the coastal wood, to the beach. A visit to this part of the coast is a must! The area in part maintains its original appearance, with its sand dunes and vegetation still intact, unlike other areas where they have been destroyed to make way for bathing establishments. Via Montello comes out at the beginning of a dam that is about 1 km long and forms the "bocca di porto" or entrance to the harbour of San Nicolo'. By continuing to your left you reach the open sea and the lighthouse named "la Pagoda". Turning right along Lungomare Dante Alighieri, you will come to Punta Sabbioni, always crowded with people and boats. From there you can catch the boat to Lido di Venezia (the service runs approximately every 30 mins.). 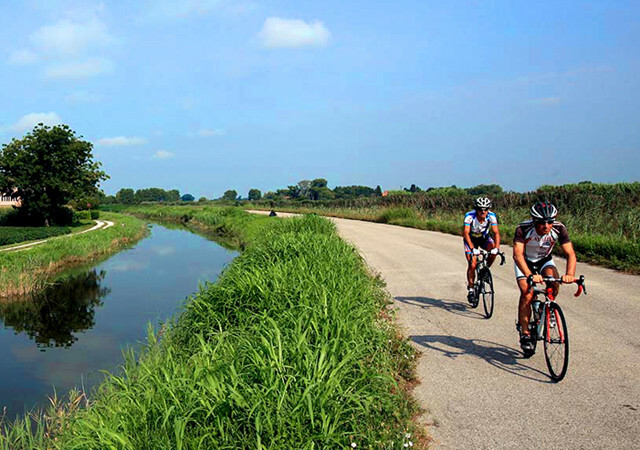 Once you have arranged your bike on board, sit back and enjoy the beautiful scenery that stretches from the entrance of the harbour to the sea and then into the Lagoon and admire the view of historical Venetian buildings that appear on the horizon. Alight at Lido, one of Venice's best-known beaches, at Santa Maria Elisabetta or the San Nicolo' terminal and proceed along the south coast to via Sandro Gallo that then becomes via Malamocco at the bridge. You will come to Riva di Corinto on the Lagoon: nearby is Isola del Lazzaretto Vecchio, which during the Serenissima Republic served as a hospital for infectious diseases and is now a dog shelter. On the right hand side you see Isola di San Lazzaro degli Armeni, a former leper colony, which since the 1700s has been home to an order of Armenian monks, disciples of Mechitar. Take the no. 20 ferry from Venice to this island where you can visit the restored church and monastery with their important masterpieces and the printing-works that still operate today. S. Lazzaro is the only small island in the Lagoon that has been left unscathed by deterioration and abandon and demonstrates how a clever lifestyle can create many cultural, sporting, productive activities. Once you reach the paddock, go back to the main road and follow a road that after a sharp turn leads to the south side of the Lagoon, opposite the island of Poveglia and the little town of Malamocco. This solitary island, once rich in salt mines and vineyards, was a lively centre, but has now been abandoned. Back on your bike, after a few kilometres you reach Alberoni, whose beach deserves a stop and a visit, with its high dunes covered by typical vegetation that make this place one of last untouched stretches of beach in the northern Adriatic coast, and provided the setting for Visconti's film "Death in Venice". Following via del Faro you will reach the southern tip of the coast and a ten-minute ferry crossing will take you to the mouth of the harbour of Malamocco and then on to Santa Maria del Mare. The island of Pellestrina is a narrow long strip of land suspended between sea and lagoon, protected from the rush of the waters by the defensive devices that the Serenissima Republic built to protect the city. The murazzi run along the shore to protect the small fishing villages that face the lagoon with its sounds and voices: San Pietro in Volta, Portosecco, an ancient port now uninhabited, San Antonio and Pellestrina. After passing Pellestrina, and the cemetery, you can walk on the large Istrian stones that form the Murazzi just a few meters from the sea. To proceed from Ca' Roman to Chioggia you must cross the opening of the harbour once again and to do so you must return to Pellestrina, from where frequent transport services will take you to town. NB: We suggest that you gather all necessary information before starting your trip.